Hello crafty friends, Sarah with you today using the AMAZING June Mixed Media Kit, designed by the one and only Elisa Ablett! That girl is seriously amazeballs! 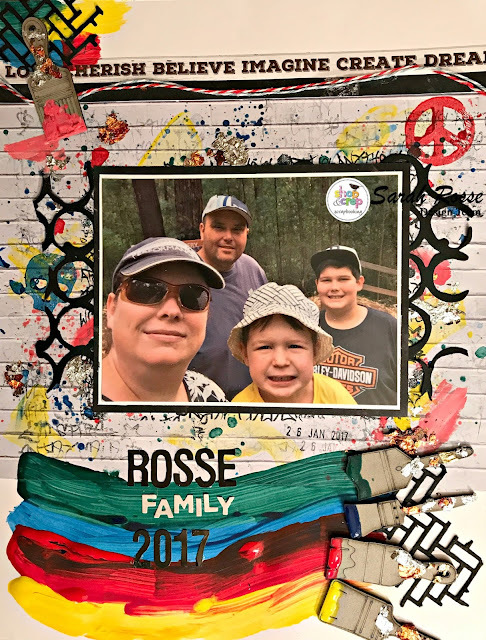 I had so much fun using this kit to make the cover page our our family 2017 album. The Mixed Media kit can be purchased instore as a once off or for a 6 month subscription. A subscription brings the price down to only $36.95 per month and what great value that is! The June kit is especially one of my favs due to the exclusive graffitti stamp in the kit designed by Elisa. I used this in one of my last blog posts and I just can't get enough of it! The other tip that Elisa outlines in this kit and that I wanted to bring to your attention today is using your wooden veneer pieces as stamps. As you can see below, the skull and the peace sign (both come in the kit) were used to stamp on to the graffitti wall background. To achieve this look, I simply applied paint to the piece using a paint brush, turned it over and stamped on to my layout! What a great idea! You could use any wooden veneer pieces you have in your stash and create stamps with them! Shop and Crop have an extensive range of wood veneer products in store that can be purchase by clicking here. I'd love to see what results you get trying this technique and thinking about how we can extend and use our supplies in various ways.